With Endeavour’s June 13 launch to the ISS now counting down, engineers are continuing to work towards the safe flight of the fleet’s youngest orbiter and her crew. To aide in this effort, the Orbiter Project Office (OPO) examined the flight performance of STS-126 (Endeavour) and STS-125 (Atlantis) – the previous vehicle flight and previous program flight, respectively – to ensure that all issues with the fleet have been properly reviewed and examined. For the review of Endeavour’s previous flight – the STS-126 mission in November 2008 – the OPO identified two issues that gained attention during the STS-127 SSP FRR (Space Shuttle Program Flight Readiness Review) last month. 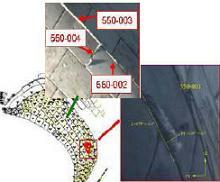 The first issue pertained to TPS (Thermal Protection System) tile and blanket anomalies. The OPO presentation, available for download on L2, noted that three gap fillers were found to be protruding from the Left OMS pod during post-launch inspections. During post-flight analysis, the cause of the gap filler protrusions was noted to be a “torn sleeve or bonding issue” that had been noted on Left OMS Pod #3 during previous flights. Flight rationale for STS-127 was obtained for this issue without much discussion. All three of the protruding gap fillers were still present post-landing and were removed prior to Endeavour’s ferry flight back to KSC in December. An investigation of the gap fillers indicated minimal RTV application/contact to the bonding surface of the Pod. The Program Data Requirements Resources Team later identified improvements to the bonded process that will ensure full length bonding of gap fillers on future flights. Additionally, the second STS-126 issue to gain recognition during the SSP FRR process relates to Ku-Band Antenna anomalies: specifically, a lack of “tracking” mode during communications operations in General Purpose Computer Acquisition Mode, Multiplexer/Demultiplexer (MDM) FF3 bypass of Electronics Assembly-1 (EA-1), Forward Link Frame Sync Telemetry Dropouts, and flawed RADAR Data during undocking. The “tracking” mode error self-corrected on FD-15 (Flight Day 15), the MDM FF3 bypass recovered with Guidance and Navigation Computer Input/Output reset, the Forward Link Frame Sync Telemetry Dropouts was an indication only and did not affect Ku-Band forward link operations, and the Ku-Band flawed RADAR Data during undocking affected range, range rate, and angle rate data displayed on Endeavour’s Flight Deck consoles. The COMM angle track issue was repeated during flow turnaround and was isolated to the EA-1; the MDM FF3 bypass was also repeated and isolated to EA-1. Furthermore, the frame sync telemetry and flawed RADAR data could not be repeated during Ku servicing. EA-1 was removed and replaced (R&Red), and a complete retest of Endeavour’s Ku system showed no repeat of any of the four errors seen during the STS-126 mission. However, should any of these errors re-occur during STS-127, there are several workaround options available to Endeavour’s Flight Crew and Flight Control Team. “Antenna angle tracking can be switched to GPC designate mode, transient conditions resulting in MDM bypass may be recovered with a GNC I/O reset, and alternate methods can be used during rendezvous to provide data normally provided by the Ku-Band radar such as the trajectory control sensor and hand held laser,” notes the OPO presentation. The OPO also noted that all three of the orbiter’s GH2 FCV (Gaseous Hydrogen Flow Control Valves) have been approved for flight, after they were installed on Endeavour on May 7 at Launch Pad 39B. The first issue from STS-125 (the previous program flight) to carry over to the OPO STS-127 SSP FRR was an erratic MPS (Main Propulsion System) Engine 2 GH2 Outlet Pressure Ducer reading. “At liftoff, the left Space Shuttle Main Engine (SSME) GH2 Outlet Pressure transducer acted erratic,” notes the OPO presentation, adding the Booster officer in Mission Control declared the measurement failed and the crew was informed to disregard the engine out cues as a result of the toggling transducer. All other GH2 Outlet Pressure ducers on the other two engines and the 2” disconnect pressure functioned normally throughout Atlantis’ ascent. At MECO (Main Engine Cutoff), all GH2 Outlet Pressure readings fell to zero on all engines as expected. Adding to the investigation is the prior history of failures for this type of transducer – which is used to measure and verify portions of the LH2 Ullage pressure control post-ascent – during fight. The measurements do not affect engine function on ascent and are used as cues for main engine shutdown, GO2 (gaseous oxygen) out temperatures, and SSME helium tank pressures. The OPO has concluded, based on previous flight experience, that the ducer issue on STS-125 is not a constraint for Endeavour’s launch as the flight control teams are trained to identify a true ducer measurement v. a false ducer measurement and act accordingly. 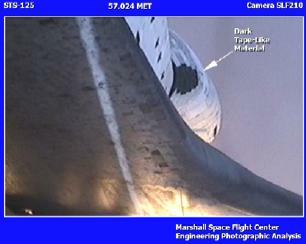 Next up in the OPO report was the TPS tile and blanket anomalies from STS-125. The OPO presentation states that “imagery analysis noted [that] a dark object appears to release from the Left Hand OMS pod” during first stage flight. A review of all pre-flight baseline images and on-orbit inspection images show no discernable gap filler anomalies. 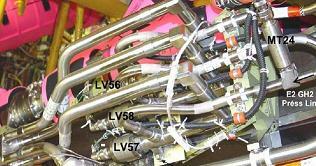 Furthermore, during flow processing for STS-125, Atlantis’ OMS pod gap fillers were inspected for the same gap filler anomalies identified during STS-126. This inspection led to the R&R of one gap filler on OV-104. Additionally, SRB video captured a gap filler – which was on its second mission and was not installed with the improved procedures identified after STS-126 – migration and liberation event at Mission Elapsed Time 57-seconds. This particular OMS Pod gap filler event is bound within the flight support analysis conducted during the STS-117 lifted OMS Pod blanket anomaly in June 2007 and thus is not a concern for STS-127. Protruding gap fillers in the same region have been noted previously on OV-105. As such, all gap fillers in the area in question on OV-105 have been inspected and/or R&Red via the improved process for this flight. The chamber pressure readings decreased to 48 psia on FD-2 before recovering slightly over subsequent flight days. However, the chamber pressure never returned to its nominal pressure of around 92 psia. There was no indication of flight safety issues from this issue, and all of OV-105’s vernier jets were confirmed to be in proper working order during the vehicle’s last flight. The degraded reading from Atlantis’ R5R vernier thruster confirms that the jet is still viable for flight even if the issue should reappear on STS-127. However, “failure of any vernier removes vernier control capability during ISS mated ops,” notes the OPO presentation. Other attitude control capabilities exist but with potential loss of mission objectives.